Is Scientology advancing or it’s at a standstill? WARNING! 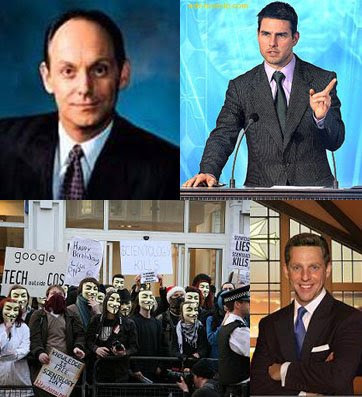 GRUPO ELRON has no connection with Scientology organizations, but only with telepathic teachings from Ron Hubbard about the mind and the universe as well as the technology developed by him to achieve clearance of mind. At the present time Scientologists know about these telepathic messages you are reading, because I have informed to Guillermo Lesevre, David Miscavige, John Fudge and Debbie Cook since the beginning, and I have invited them many times so that they be contacted telepathically with Ron Hubbard, however, they never responded me. I have also invited numerous times to many scientologists, but none of them responded me either. I have also requested that they send me questions that only Ron Hubbard could answer, but nobody replied. Scientologists simply don’t want to accept that we are receiving telepathic messages from Ron Hubbard. Notice the following thing: Where would they be if this were truth? There is an enormous EGO from them. Then they prefer not to discover it. Nowadays, Scientologists have transformed Scientology into a sect. And now they are not allowing the entrance of new Light or knowledge, if this situation continues, sooner or later Dianetics and Scientology will be obsolete. Ron Hubbard himself wrote in his book “A history of Man” that Thetans communicate telepathically. However they have not even try to contact him through mediumship. No wonder why many people confuse some teachings of Scientology and attack Scientology because Scientologists are doing things wrong. Not even Tom Cruise is helping Scientology now, since he has been compared with a Nazi leader. Something must be done to clear this up! GRUPO ELRON is only revealing the information received from the Masters of Light, Therefore, you are free to choose whether to believe it or not. Nobody is forced to follow a path since all of us have free will. Contrary to a sect GRUPO ELRON is an Anti-sect. We do not ask or receive money and all our information is given freely. We are not looking for followers either; this is part of our free will also. In addition, those who believe that these messages are good are free to share them with whomever they want. Those who don’t agree with these teachings are also free to ignore them as well. Regarding to telepathic messages, even children in our sessions have asked to the Masters of Light and they have answered the questions. Ron Hubbard: I am again with you here. I Am Ron. Ron Hubbard: In the spiritual plane with the help of Johnakan, I have learned many more things that are not written in the documents I left when I was incarnated, and it is a pity that we cannot transmit them because not only have they stayed stuck in time, but rather they have closed the doors. They don’t want to know anything about new paradigms and then they obstruct the mission. Ron Hubbard: Most of the human beings, like our brother Jiddu Krishnamurti said, -and I mention him because he is a true leader- they are conditioned. Ron Hubbard: Unfortunately they are very skeptical. But there is one thing more, the current great leaders of the Church of Scientology, “alleged representatives of the Master Jesus,” who is known by everybody and I say “alleged” because for me the only true representative incarnated is the Master Johnakan. These leaders are arrogant and most of them would not find convenient if the Master Jesus embodied again because they would lose their prominence. Ron Hubbard: They don’t care about the teaching, they are more interested in playing their roles, and the EGO they have is the biggest obstacle so that they come and communicate with me in spite of what I left written. Then, they prefer to ignore it. This entry was posted at Monday, June 22, 2009 and is filed under Who are they? . You can follow any responses to this entry through the .